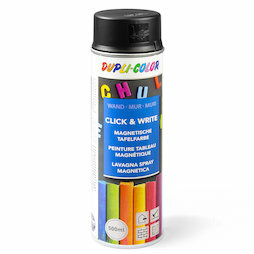 The blackboard varnish "Click & Write" is a ferromagnetic blackboard spray paint. After prepping the surface with the spray paint, you can write on it with chalk and wipe it down with water. The iron particles in the spray allow you to use magnets on it. The spray can be used on different surfaces such as metal, wood, stone and various plastics. With a 500 ml can you can prep areas of 1.8 - 2.0 m² (one coat), to which magnets will barely adhere. To enhance the magnetic effect you will need several coats. A spray can will then last for about 0.5 - 0.6 m². Which magnets to use with magnetic paint?